The story of Adrian and Gillian Bayford is one that many people remember. They won the second biggest National Lottery jackpot ever in 2012 scooping £148 million. However, the win didn’t go according to plan and life has been somewhat up and down for the couple since. Even more so now that it’s been revealed scammers are trying to cash in on their name. Here’s the lowdown on their story and the Adrian and Gillian Bayford lottery scam. 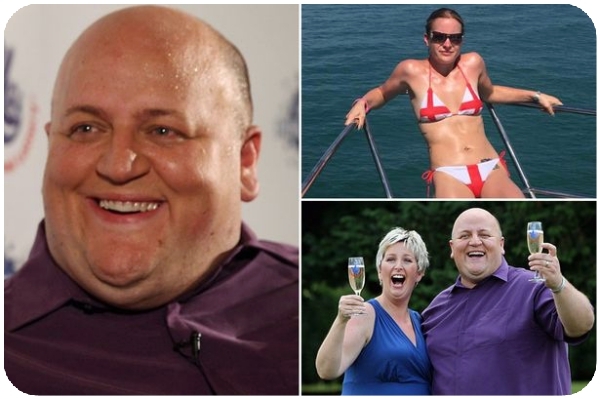 Adrian Bayford and his wife Gillian scooped a staggering £148,656,000. 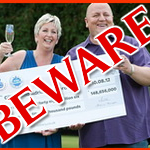 The Haverhill couple won Britain’s second-biggest lottery jackpot ever in 2012. It changed their lives forever. Adrian at the time, owned a music centre in Haverhill, while Gillian worked on the children’s ward in Addenbrooke’s Hospital. The win was the result of fourteen rollovers on the Euromillions and they were the only winners. They tried to let the news sink in but started working out how they’d spend the money straight away. However, Adrian’s co-owned business soon closed down. Banners and signs were put up in the window of the Suffolk Music Centre advertising “closing down sale”, “all stock must go” and “huge savings”. But by January 2013, it appeared that Adrian was converting stables in the grounds of his new mansion into a workshop for musical instruments. He felt there was a “Lotto cloud” hanging over his old business and therefore decided to re-launch in the spring as an online-only concern. Given her background, Gillian said she wanted to do things for her children, Aimee and Cameron, so she bought the Cheeky Chimps children’s play barn in Haverhill. The play barn, renamed Rascals, opened its doors in 2013. But just a few months later it had to close down, leaving many people devastated once more. That same year, Adrian and Gillian separated and divorced. A statement released on behalf of Gillian confirmed that the marriage had broken down “irretrievably”. Mr. Bayford reportedly moved out of the family home, to a £500,000 house, with a built-in leisure complex and a six-car garage. The couple denied there were any affairs on either side which drive them to separate, but a few months later in March 2014, it was reported that Adrian Bayford was engaged to Samantha Burbidge after a six-week relationship. The Daily Mail reported that Adrian and Samantha, then 27, were going to wed in a “James Bond-style” ceremony where the groom and his party would wear white suits, while the bride-to-be would walk down the aisle to the 007 theme tune. However, it was reported that after three years together, Samantha walked out on Adrian, and he started a relationship with Lisa Kemp, which also ended when she walked out on him in June 2018. In 2017, Gillian decided to help a disabled four-year-old the Christmas gift of a lifetime in the form of a specially-adapted home. The young lad called Blake McMillan has a rare neurological disorder called MECP2 duplication syndrome. In her role as manager of A&G Properties in Scotland, she found a suitable home for the family and paid to have it adapted for him to give him the best quality of life possible. Six years on, in June 2018 it was revealed that Adrian was opening a new music shop on the site of his old one. The multi-millionaire owns the freehold of the premises and the new shop, which is reportedly being managed by two of his friends. So that’s the story of the Bayfords up to date. In the years since their win, it’s been revealed that scammers have tried to use their name to extort money from unsuspecting people. Here are the lowdown and the story so far. 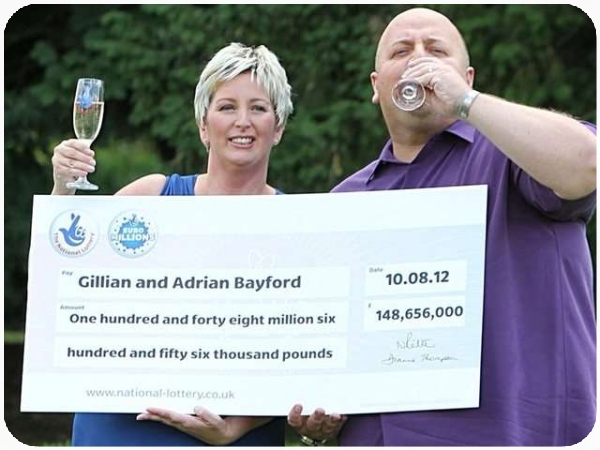 When Adrian and Gillian Bayford won the EuroMillions jackpot of £148 million in August 2012 they always said from the outset that they would use the money to help others and wanted to benefit their family and friends too. They never said anything about wanting to help scammers, but that’s precisely what has happened. A group of mean-minded scammers has decided to put their heads together and use Adrian and Gillian Bayford’s name to pull off one of the oldest cons in the book the ‘fees up front’ scam. It seems that there has been a raft of emails going out claiming that the Byfords want to share their wealth out with people. An email might arrive in your inbox asking you for some personal details including your name, country, age, occupation and phone number. The email looks convincing as it contains a link to a BBC news article announcing ‘their’ win. So it’s easy to see how people can get sucked in as it looks particularly legitimate. However, once you scratch below the surface, all sorts of inconsistencies emerge. Different versions of the email might say ‘random selection was done by the legal advisers to this donation program’ or ‘your email, was given to us by Google management’. So, who’s got anything to gain by randomly selecting people to win, when there are people in their own community that could benefit? To make a further point, Google will never ever give out email addresses. That is against the law. The other main problem is that the email address which the messages are sent from gives one address, and the email address you’re supposed to respond to is a different address. Some scammers have got very clever by using Adrian and Gillian’s names and referencing your email provider. This is to lull you into a false sense of security and make you feel safe. Don’t be taken in! It’s a scam! 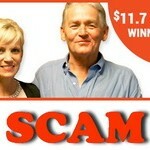 This scam is known as ‘an advanced fee lottery scam’. What happens here is that once you’ve sent on your personal details, scammers will send another email claiming there are upfront payments required for legal purposes. They might ask you send insurance, transfer and banking fees. So then, the person being scammed send a small amount of money, but never receives a prize. You can check out current email/lottery scams doing the rounds by logging onto sites like Hoax-slayer.com, spamfighter.com, ripoffreport.com or reading reviews and people’s complaints on Lotto Exposed. If you feel you’re being scammed yet can’t find any details of it online, report the email to your service provider and the police. If still in doubt, type the details of the email into a search engine and see if anyone else has complained about it or as reported. The bottom line here is that anyone emailing you, telling you you’ve won some money and then asking you to give a fee upfront to receive your prize is going to be a scam and should be reported and avoided at all costs. Only ever play lottery games through reputable sources and never respond to any emails asking you to send money on. If you feel you’ve been attacked by a scammer in this way, report it to your email provider and to the police, who will deal with it accordingly. The more information you give, the better the chances of stopping these scams are. BEWARE – the Adrian & Gillian Bayford Scam! 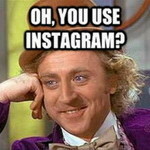 The New Instagram Scam Is Popping Up. Folks Beware!! !